Jim has provided legal counsel to clients in very challenging legal, financial and business matters for more than 40 years. Whether the client is a multibillion-dollar, publicly-owned bank holding company or a family business—his clients receive responsive, reliable advice to guide them through their legal needs. An NFL quarterback, a banking trade association, a billion dollar family-owned business and an internationally famous auto racetrack have all turned to him for legal advice. 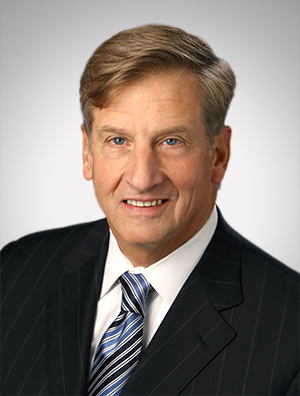 Jim has represented clients with diverse businesses including a nationally recognized healthcare system, the independent directors of a Major League Baseball franchise, a German auto parts manufacturer, an educational opportunity foundation and one of America's most recognized Universities, to name a few. He is well-known for his representation of banks in Wisconsin and for his experience in dealing with federal and state bank regulators. His in-depth knowledge of the banking industry and his creative approach to navigating legal issues have resulted in several first-of-a-kind transactions for his bank clients. Jim’s experience allows him to assemble teams of lawyers to efficiently and successfully handle countless legal matters including business litigation, securities offerings, mergers and acquisitions, labor and employment, tax, employee benefits and more. As past Chair of the Quarles & Brady Financial Institutions Team and a Director, and member of the Executive and Audit Committees of the Wisconsin Association of Manufacturers and Commerce (WMC), he understands the increasingly important role directors play in corporate governance. He has represented boards and individual directors in extremely challenging legal and public relations matters - guiding them through the sale of an MLB franchise, extricating them from government regulatory enforcement actions, securities class actions and helping them to understand new and complex government rules. He is frequently called upon by reporters as a knowledge resource for comment on industry news. Financial institutions of all types and sizes and their holding companies, in all aspects of their business, including regulatory, merger and acquisition, corporate and securities matters. Manufacturers, service businesses and health care providers in a full array of corporate, transactional and international matters. Businesses, boards of directors and independent directors or committees of directors in corporate governance, audit or transactional matters. Family-owned businesses and successful entrepreneurs, ranging from the auto industry to the banking industry. Recognized as Best Lawyers® 2016 Milwaukee Litigation - Banking and Finance "Lawyer of the Year"
Recognized as Best Lawyers® 2014 Milwaukee Financial Services Regulation Law "Lawyer of the Year"